Summer is here and it’s a great time for your whites, rosés and light bodied reds! 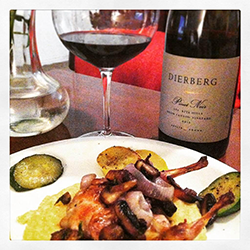 This bright fruity delicate pinot pairs deliciously against the gaminess of these small birds. Begin by rinsing off your birds and patting them dry. Preheat your oven to 500′ or as hot as your oven will get before broil. This may take up to 30 minutes for some ovens so get this going right away. Sprinkle each bird with salt and pepper and stuff each with 1 crushed garlic clove and a pinch of parsley and thyme. Prepare for polenta by heating your water or stock in a medium sized pot over high heat. Heat an oven-safe heavy bottom or cast iron pan over med-high heat. Melt butter in pan (watch heat, do not burn butter). Add each bird breast side down. The butter will bring beautiful color to the birds in the short cooking time. Brown for 3 minutes then add mushrooms, shallots, apricots, and whole sprigs of thyme to pan. Turn the birds and brown for 3 minutes. Make sure the apricots, mushrooms and shallots are coated in the butter so as not to burn when transferred to oven. Move cast iron pan into hot oven and let reach 155′ when thermometer is inserted, roughly 5-7 minutes. Meanwhile, add your dry polenta to boiling liquid and stir with wooden spoon. Turn off heat below the polenta and stir periodically until ready, 5 minutes. Pull out your beautifully golden birds and plate over a nice mound of polenta. This dish could be accompanied by a sautéed seasonal vegetable, snap peas, heirloom carrots, or even squash! Enjoy!